Because of our strong network of the best PCB design professionals, MOKO provides exceptional printed circuit board design and PCB layout services. 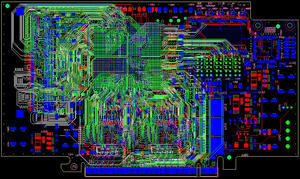 Our veteran designers can do the most complicated PCB designs imaginable. We are experts in RF/Microwave, mixed signal-digital and analog, huge FPGA layouts & FPGA high layer, and high current power supplies. Our high tech specialties make us the ideal solution for any project size when looking for a Bay Area PCB designer. Whether you need a new design or modification to an existing PCB design product, our expert PCB designers will provide you with error-free printed circuit board design and PCB layout solutions from simple 2 layer PCB designs to complex, high density, 30+ layers. We can design in rigid, rigid-flex PCB, or flex, of any shape or size. Deliverables include all necessary documentation required for printed circuit board fabrication and assembly, including special requests, Bills of Materials, ICT, and X-Y placement files. Unlike many PCB design companies, we also include the complete design database files. Call us at 86-755-23725796?or get an instant PCB quote.